I am straight up addicted to granola! 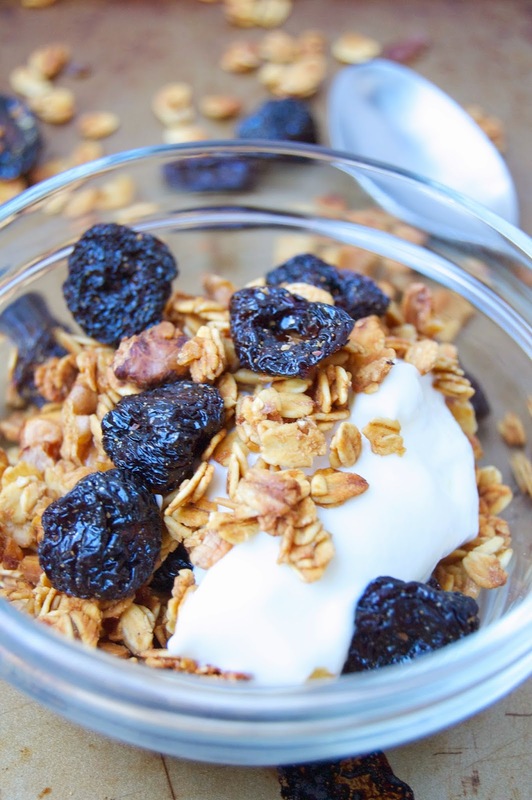 I eat it for breakfast almost every day with Greek yogurt, milk or berries. Usually a batch of granola lasts me around two weeks, but recently the Hubby has started getting into my stash, so I find myself making granola pretty much every weekend. Don't get me wrong, I am more than happy to do this. Plus, this is the first time I've seen the Hubby actually eat breakfast in the more than 10 years we have been together. 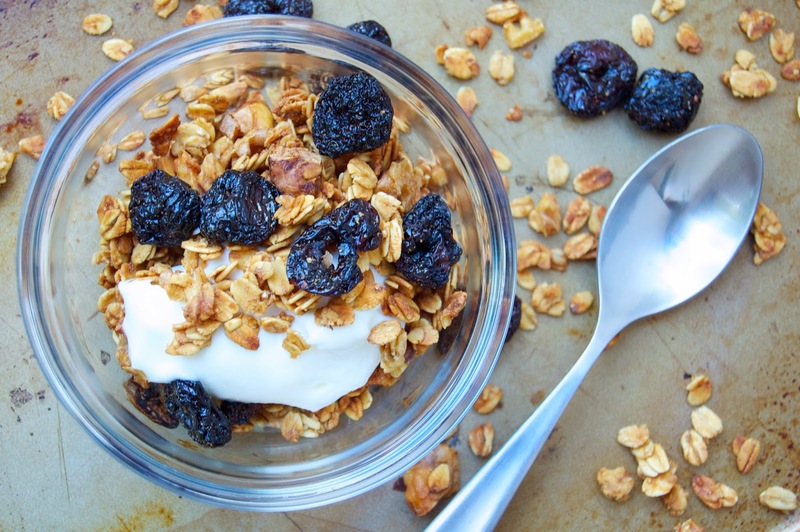 I started making some of my past recipes like Crunchy Nut Granola or Pumpkin Granola (which I totally need to revisit and re-photograph)! 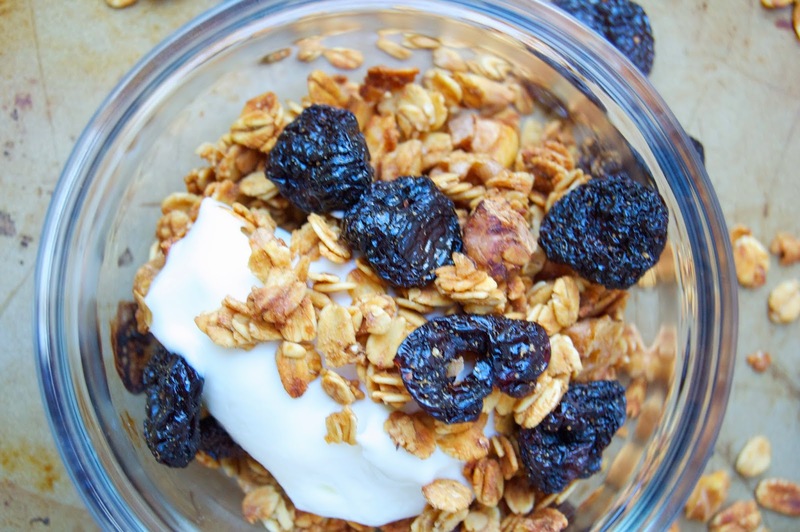 However, he likes his granola a bit sweeter, so I took the basic principals, measurements and cooking instructions, then just changed the ingredients a bit to include more maple syrup (my favorite Fall sweetener) and dried sweet cherries. Mix the Grapeseed oil, nutmeg, cinnamon, maple syrup and applesauce until well blended. Stir in the oats, walnuts and pepitas. Line a baking sheet with foil and lightly grease with oil or butter. 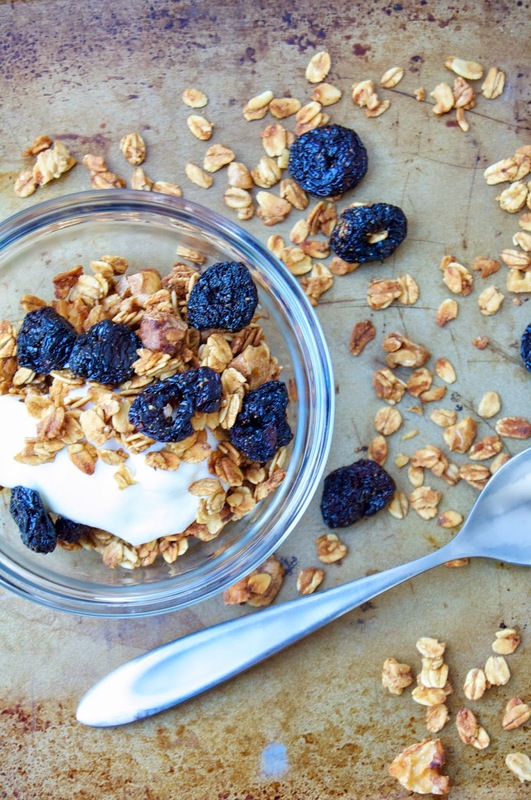 Spread the granola mixture on the baking sheet. Bake at 325F for around 40 minutes, stirring every 15 minutes. Let sit to room temp and stir in the cherries. Recently, the Hubby and I celebrated our third anniversary. Hard to believe how fast time flies! One of our favorite things to do together is dine out. We like good food...actually, let me rephrase that: We love great food! Even though we cook a lot at home, we always appreciate the hard work that chefs and restaurants put forth in our area. So we try to support them as much as possible. 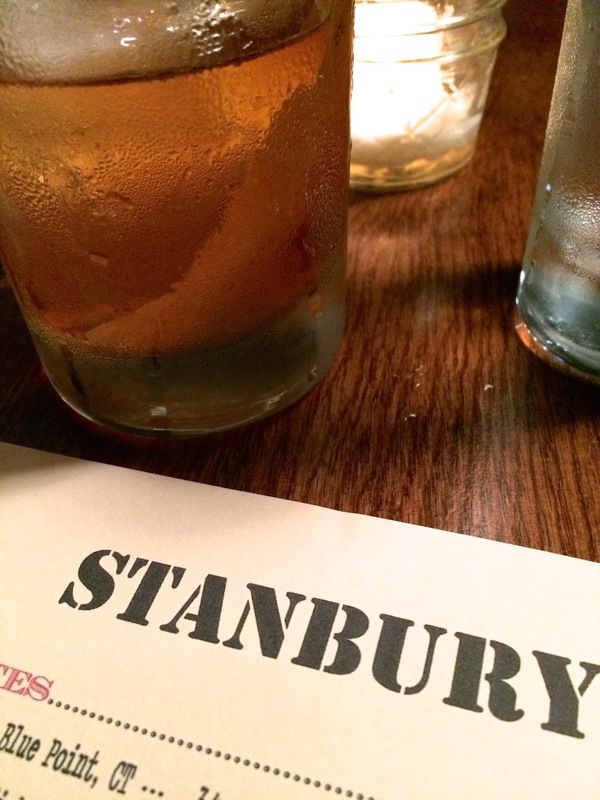 One such restaurant is Stanbury in Raleigh. We decided to try it out for the first time for our anniversary! From the start, we were impressed. The restaurant isn't downtown or in a strip mall, but a stand alone place near Peace College and Seaboard Station. We walked in and snagged the only two seats left at the bar while we waited for our table. The place was hoppin' for a Wednesday night, and you could tell everyone was having a great time. 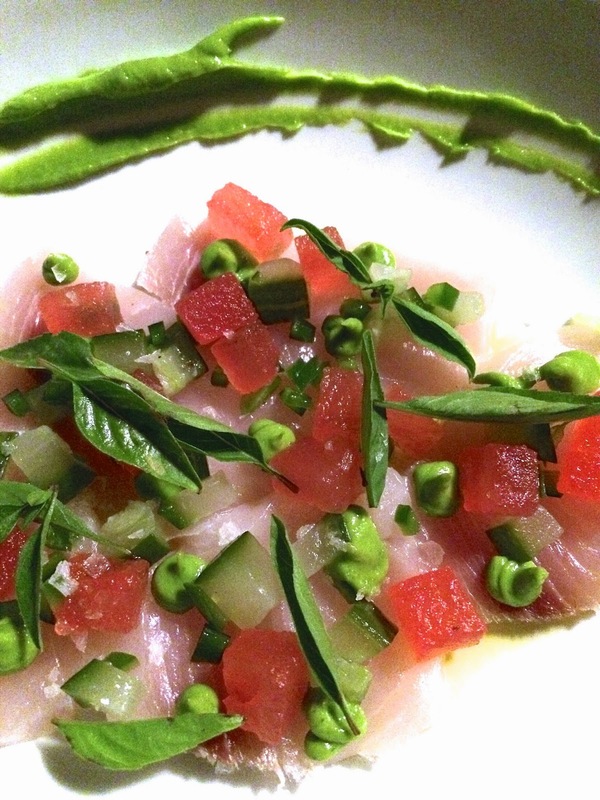 First course - NC Swordfish Crudo with watermelon, pickled cucumber, jalapeño and basil. This was like biting into flavorful air! The dish was so clean and refreshing, but then you get a bite with all the flavors and get that surprising punch from the pickled cucumber. The herbaceous basil gave it a nice peppery finish. Oh man, this was definitely MY favorite of the night!! 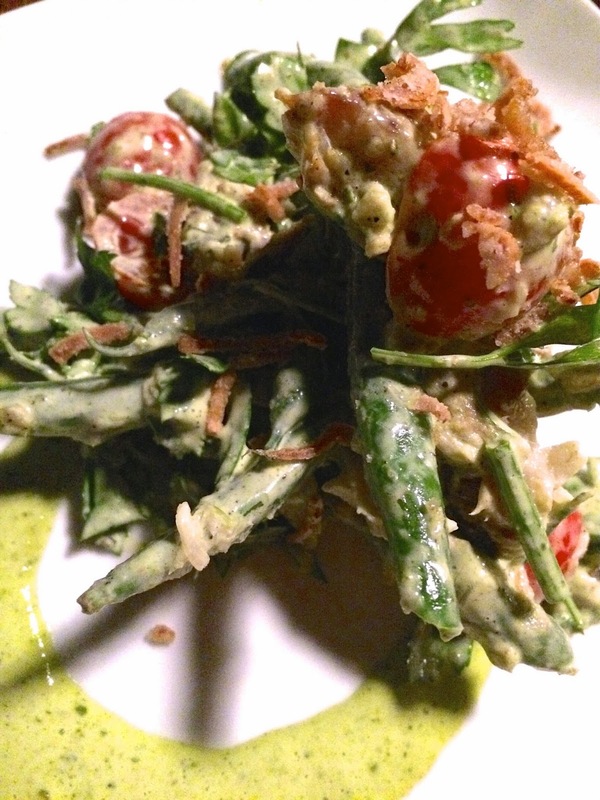 Second course - Green Beans with smoked blue fish, green goddess dressing, tomato and crispy shallot. This one was like biting into straight up smoke, but it wasn't overwhelming because the green beans smoothed it out. I'm a big fan of a dish that can cover all the consistencies - creamy, juicy, crunchy, crispy....this one had them all! 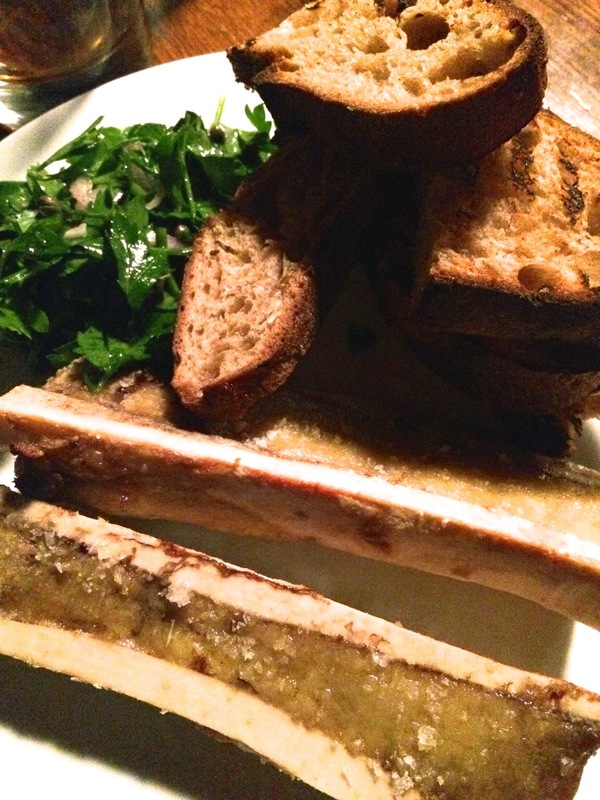 Third course - Roasted marrow with parsley, shallots, capers and Boulted Bread. This one was all for the Hubby! Seriously, look at the size of that bone! It was fatty and greasy and all the right things. Oh....My....God! I barely have words to describe this. Simple decadence. 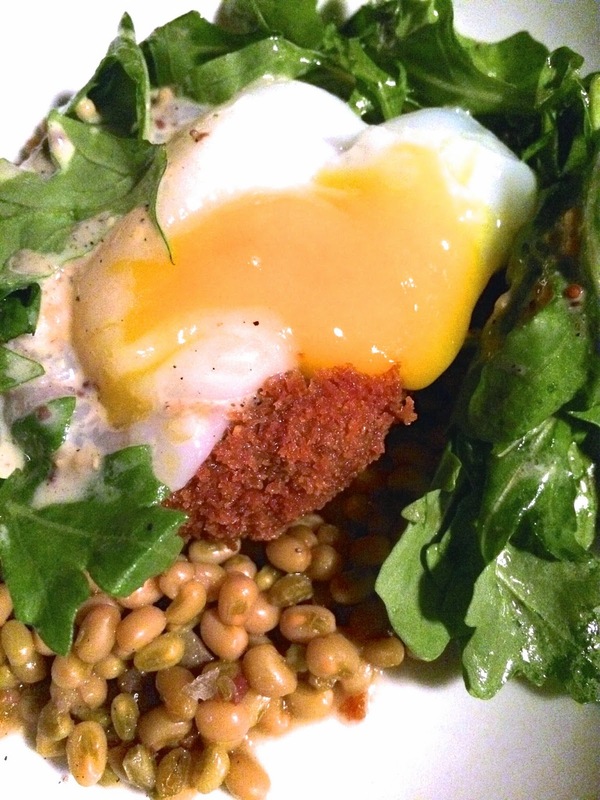 Fourth Course - Crispy pig head with field peas, a 62 degree egg, arugula, mustard and creme fraiche. I thoroughly enjoyed this one - best pulled pork in the form of a crab cake EVER! The mustard cream gave it a nice punch. Another dish that seemed to cover all bases on the consistency spectrum - fresh arugula, creamy egg, earthy lentil, crispy pork and spicy mustard. Fifth Course - Seared scallops with farro, roasted turnips, greens and mustard cream, or as I like to call this one, Surf and Earth. Hearty, filling, and once again the mustard flavor bringing everything together. 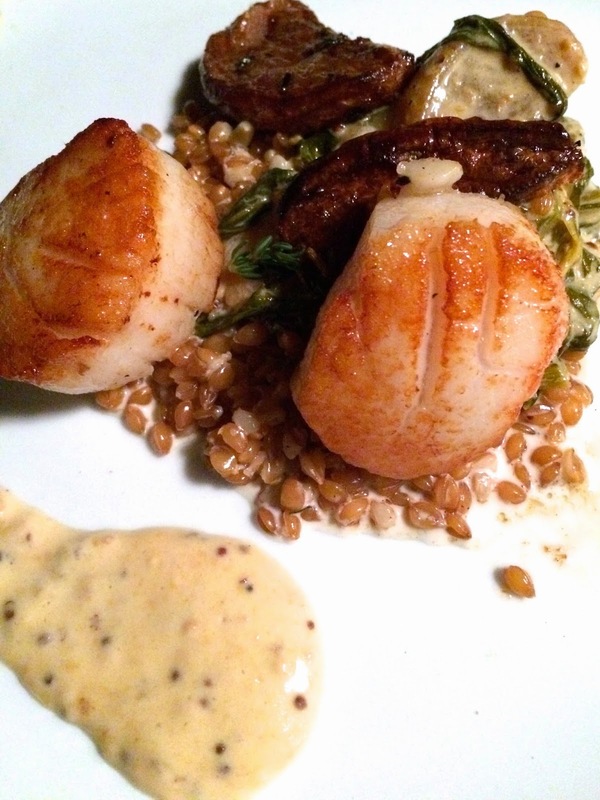 This earthy meal had a bright, fresh finish, and the buttery addition of the scallops rounded things out perfectly. 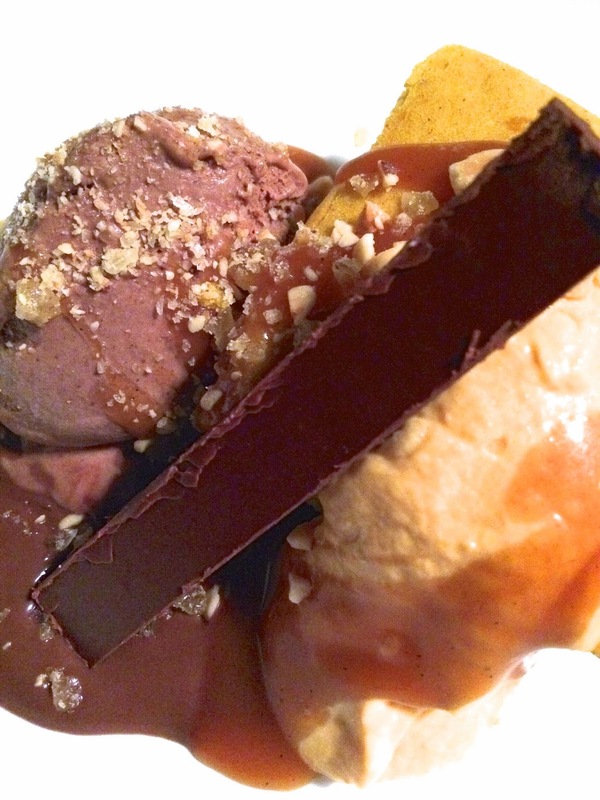 DESSERT - Escazu Chocolate spiced ice cream with pumpkin cake. If this dessert doesn't embody the Fall, then I don't know what does! One bite gave us pumpkin pie, spicy chocolate and Kit Kat all in one! Dessert heaven! Artisan chocolate shop Escazu is right next door to Stanbury, so I have a feeling they always have good desserts. 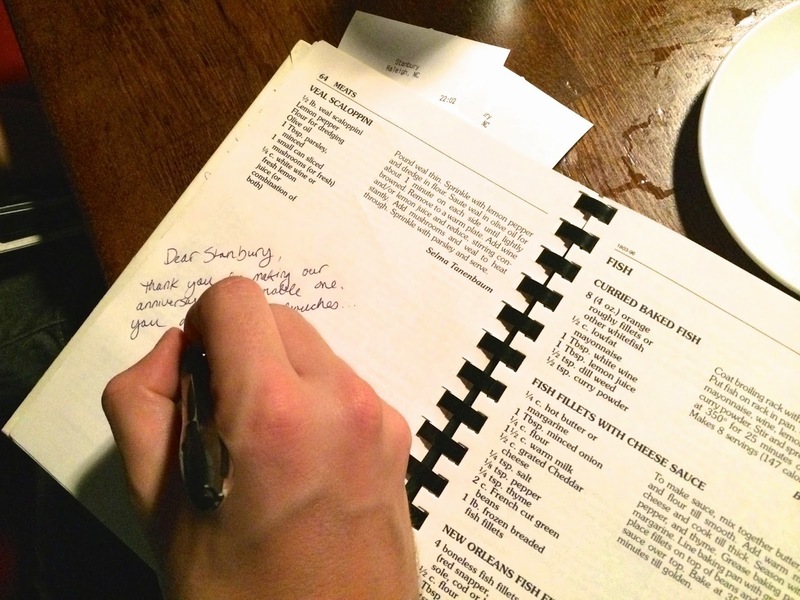 I was so sad to say farewell to our perfect anniversary meal, but we left a little note in one of many old cookbooks that they bring the bill in. We shall return to Stanbury, with even bigger eyes and emptier bellies!! 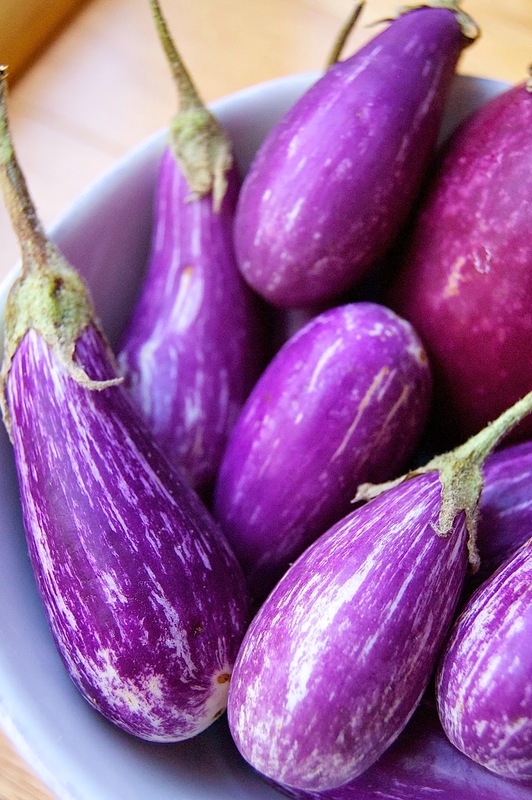 Fairytale Eggplants are the cutest and most delicious little vegetables! I first came across them about a month ago and I couldn't help but think how cute they were. I hesitated to buy them because I wasn't quite sure how to cook the little purple gems. After circling the market twice, I decided to go for it. Eggplants are tricky. Unfortunately, there hasn't been a lot of success with the vegetable in my kitchen and the Hubby usually won't eat them because of the mushy texture and chewy skin. I agree with him. 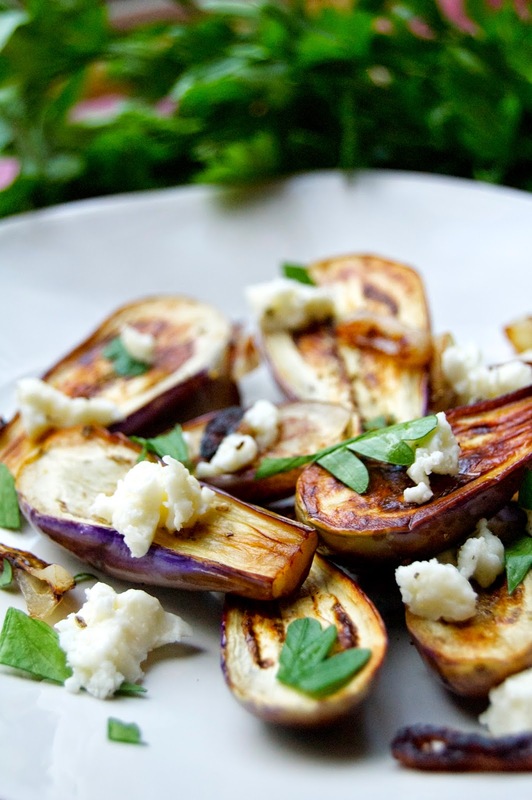 In theory, eggplants are hearty and filling and would be perfect for a vegetarian meal. They just never settle well with my stomach. So, why did I buy them?? Well first of all, they were adorable. And second of all, I love a good challenge in the kitchen! The farmer informed me that the skin on the smaller eggplants are much thinner and easier to chew. Selling point #1. He also informed me that they cook pretty quickly, so it makes a wonderful weeknight side dish. Selling point #2. And finally, small eggplants, like Fairytale's, don't have many seeds in them (which is what usually bothers my stomach). Selling point #3...and sold! 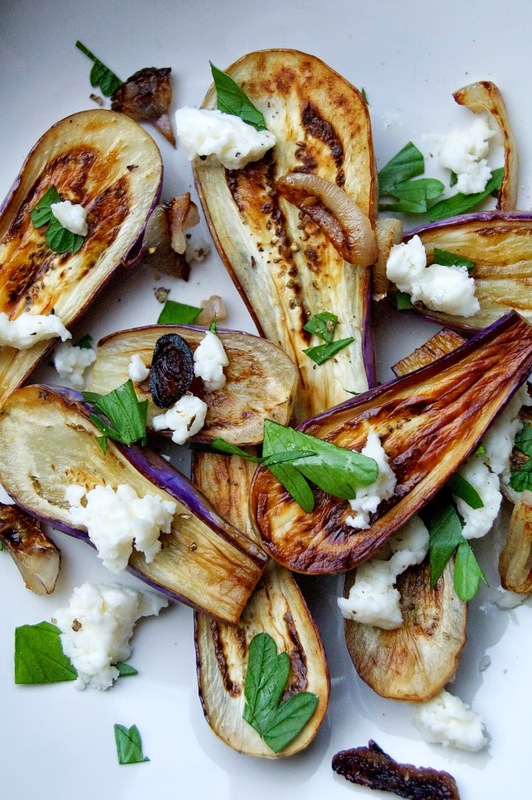 When thinking about cooking the eggplant, I decided to build in some layers of flavor. I knew that in order to get the Hubby to at least try to eat them, I had to add two elements; creamy (that is where the cheese comes in) and crunchy (crispy shallots and fresh parsley). Changing things up, I went for the cast iron skillet instead of a roasting pan and I pulled out shallots. I started with the shallots not only to infuse the oil, but also to create crispy, caramelized shallot slices for garnish and flavor. I didn't tell the Hubby I was making eggplant at first, and honestly didn't expect he would even try it. Much to my surprise, he was feeling adventurous and ended up LOVING them! It was such a win for me. Not only did my stomach handle them with ease, but the taste was fantastic AND the Hubby approved! 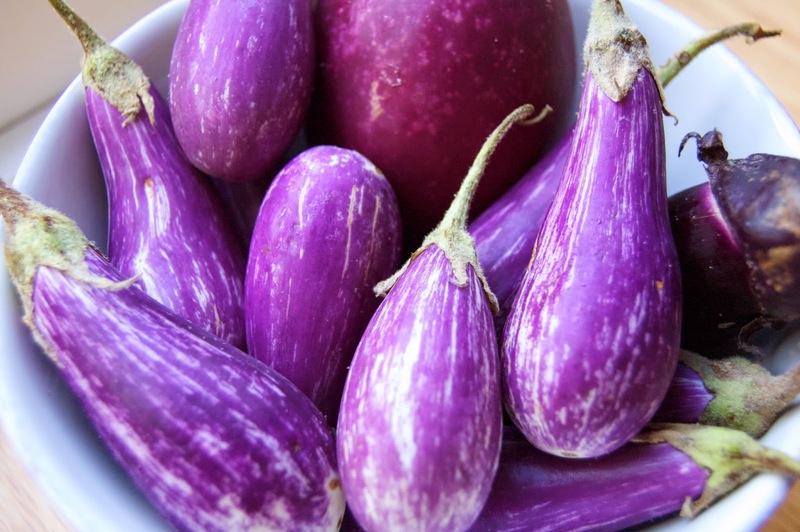 Many of my friends and followers ask me about eggplant all the time, and I am officially here to tell you not to be scared of it! I have literally avoided buying eggplant for most of my adult life because I was never able to find a good way to cook and never enjoyed it. Well, friends, today is a new day! In a large cast iron skillet, heat the oil over medium heat and sauté the shallots, stirring constantly until slightly crispy and caramelized. Remove the shallots and place on a paper towel reserving the oil in the skillet. Place the halved eggplants skin side down first in the heated oil and sauté for 2-3 minutes. Flip the eggplant and sauté on the other side for 2 more minutes until slightly browned. 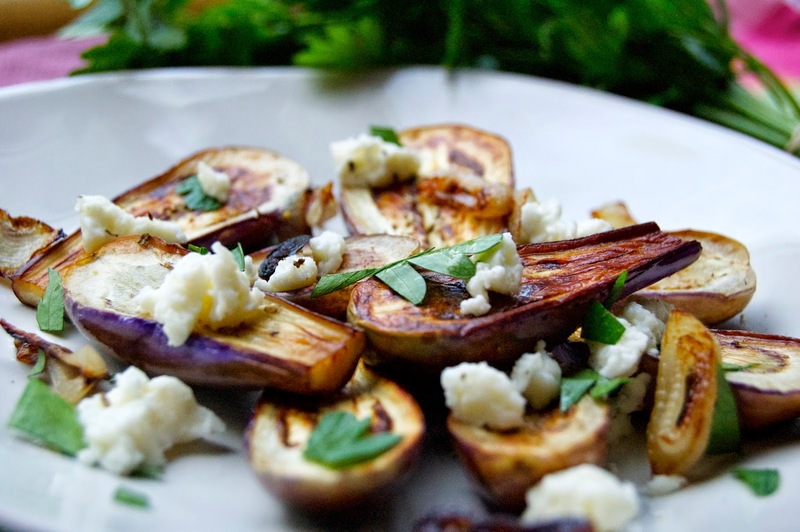 To serve, place the eggplants on a plate and add the crumbled cheese, parsley and reserved crispy shallots on top. Season with salt and pepper.